A typical donkey cart waste management team. Donkeys and their owners have taken on the responsibility of collecting more than half of the rubbish in a city in Pakistan, with only 40% of the city’s waste collected by the authorities, a study has found. And this waste collection, in the Jamali Goth neighbourhood of Pakistan’s largest city, Karachi, was the primary source of income for 89% of donkey owners interviewed. 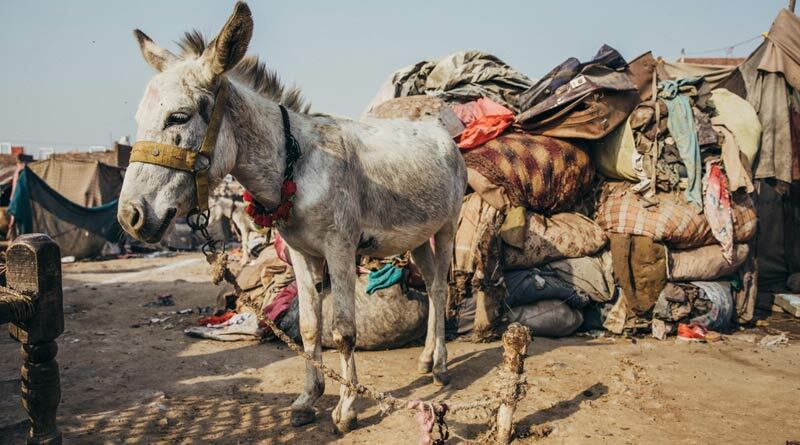 The research was carried out by global animal welfare charity Brooke, identifying the vital link between the welfare of cart donkeys working in waste management and the livelihoods of their owners. When asked what would happen if their donkey died, 83% said they would have to buy another donkey or, with no other means of earning a living, face starvation. Pakistan has the third largest donkey population in the world, with about 5.8 million working equids in total. Throughout Karachi, donkey carts are abundant; they are used in the transportation of building materials and fresh produce as well as for garbage removal. Brooke, which has operated in the country since 1991, works with the government, local policy makers, communities and owners to bring positive change to the lives of these animals and the people who depend on them. Karachi is home to more than 24 million people, who produce 4.9 million tons of waste annually. As with all major cities in Pakistan, the current methods for solid waste management are inadequate, leaving livelihood opportunities for private ‘waste pickers’ who use their donkeys to collect waste from houses and take it to the dump. In fact, Brooke’s study found that only 40% of the city’s waste was collected by the authorities. The study found that the average income for such waste pickers was 7000 rupees (£78) per month. Community members who were interviewed believed that if cart donkeys stopped collecting waste there would be a large build-up, demonstrating the community’s reliance on the donkeys and their owners to carry out this vital work. This heavy reliance has an impact on the welfare of animals carrying out the work. After assessing more than 200 donkeys, the research team identified health and welfare problems including eye infections, lesions, muzzle mutilations (78.4%), lameness and low body condition scores. Some 66.7% of donkeys had superficial knee lesions. The welfare of humans was compromised too, with many owners facing problems relating to the physically demanding nature of the job and low wages. Besides the need to improve waste management systems, the study demonstrated the need for improved policy surrounding the welfare of both animals and owners. On April 3, Brooke Pakistan launched a policy brief at an event attended by government ministries, INGOs and civil society. Going forward, Brooke will work with policy makers to push for new laws ensuring OIE standards for livestock, better health and safety training for those collecting waste, and better access to clean water, health, sanitation and education services for all involved. The Role and Welfare of Cart Donkeys Used in Waste Management in Karachi, Pakistan.